SPW027196 SCOTLAND (1929). 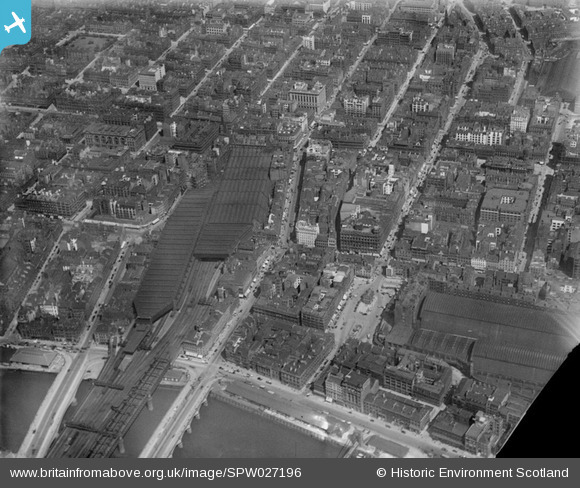 Glasgow, general view, showing Central Station, St Enoch Square and Renfield Street. An oblique aerial photograph taken facing north. Title [SPW027196] Glasgow, general view, showing Central Station, St Enoch Square and Renfield Street. An oblique aerial photograph taken facing north. Former Waterloo Street Post Office now the Atrium Building. St St George's Tron Parish Church. Northern Commercial Union Assurance Group building. Buchanan Street at Gordon Street. Hope Street/Renfield Lane, Daily Record Building. St Vincent St, Bank of Scotland.